Federica Mogherini has been busy in recent weeks, appeasing one repressive regime after another. Mogherini, the High Representative of the Union for Foreign Affairs and Security Policy, began with Iran. "Mogherini was mute on the popular uprising in Iran," wrote Eli Lake at Bloomberg. "She waited six days to say anything about the demonstrations there. When she finally did, it was a mix of ingratiation and neutrality. 'In the spirit of openness and respect that is at the root of our relationship,' she said, 'we expect all concerned to refrain from violence and to guarantee freedom of expression'". Swedish Foreign Minister Margot Wallstrom, who was proud to lead "the first feminist government in the world", merely tweeted that she was "following" the demonstrations in Iran. UN Watch condemned her for being silent. A year ago, Swedish Trade Minister Ann Linde and ten other female members of the Swedish government marched in front of Iranian President Hassan Rouhani wearing hijabs. While real Iranian girls were marching to protest the mandatory hijab, Ann Linde was retweeting about laws against climate change during the severest days of Iranian repression in the streets. All the European officials have been not only mute about the Iranian attacks on their own people. They have also been missing "a robust defense of Western values", now under attack in Iran: freedom of expression, freedom of assembly, freedom of the individual, separation of religion and state, judicial process -- all principles Iran's mullahs have battered in their fight against their own people. Europe's officials, who in the last two years have intensified their collaboration with Turkey, have also been silent about Ankara's having officially joined of the global club of dictatorships. For the first time, Freedom House downgraded Turkey's rating to "not free" in its annual report. Freedom House blasted "the mass dismissals of state employees, the mass replacement of elected mayors with government appointees, arbitrary prosecutions of rights activists and other perceived enemies of the state". A day after Trump administration suspended $65 million in aid to UNRWA, the UN Agency assisting Palestinian refugees, a European country, Belgium, stepped in with an immediate disbursement of $23 million. Brussels felt the moral and political urgency generously to fund an organization that has allowed its schools to be used by Palestinian terrorists to fire rockets at Israel and its textbooks to demonize Jews; that gave jobs to Palestinian terrorists and that is accused of creating and perpetuating the Israel-Palestinian conflict? Most of Europe's countries recently voted with the Arab and Islamic regimes at the UN to disavow Israel's and Jewish ancient ties to Jerusalem. Europe is said to be alarmed about the US and Israeli threats to retain the "status quo" in the holy city. But the same European countries had no time to condemn Palestinian leader Mahmoud Abbas's speech in which he called Israel "a colonial project that has nothing to do with Jews" and in which he again trafficked with Holocaust denial. Abbas, in fact, incredibly said that six million Jews preferred to be killed by the Nazis in Europe rather than leave for Israel – disregarding the comprehensive searches of houses for Jews to keep, torture and kill that was pandemic during World War II. Europe also stood silent after Iran's Supreme leader Ali Khamenei called for "Death to Israel" and Israel's "defeat". European officials dismiss the Islamists' threats to throw the Jews into the sea. Recently in Cairo, Ahmed el-Tayeb, the Grand Imam of Al Azhar -- considered by many to be the highest Sunni Islamic authority -- organized a conference on Jerusalem, in which he attacked "Zionism". Abbas also improbably claimed there that Palestinians have been in Jerusalem "before the Jews", despite the fact that Muslims did not even exist until the seventh century, hundreds of centuries after the Jews. Pope Francis, instead of condemning this incitement to hatred against the Jewish people, sent a letter to Imam al Tayeb thanking him for the invitation. How is it possible that the world's highest Catholic authority does not feel any urgency to denounce the avalanche of anti-Semitism and hate coming from the Islamic authorities, but pleased them by sending a letter of support? He is evidently hoping, in the words of Winston Churchill, that "the crocodile will eat him last." "Postmodern civilization has politically and morally dismantled the culture of our time and this explains in great part why some of the 'monsters' that we thought we had destroyed for ever after the Second World War, such as the most extreme forms of nationalism and racism, have revived and are at large once again within the heart of the West, threatening once again its values and democratic principles". In Europe's squares and streets, Vargas Llosa's "monsters" now are back disguised as slogans and bombs hurled mostly at Jews. Take what happened in just the last month. In Milan, Italy, people shouted "Jews, remember Khaybar, the army of Muhammad is returning" -- the Islamists' battle cry to enslave and massacre the Jews. Meanwhile firebombs were hurled at Swedish synagogues and a Jewish store in Paris was destroyed. These are the "monsters" now filling Europe's public space. Eli Lake was right saying that Europe's officials have become the face of "appeasement". In their obsequious submission to political Islam and Islamic terrorism -- presumably in the hope of being able to prevent them -- they have become even more than that. As their bromides on the Iranian repression and their funding the Palestinian rejectionists show, Europe's officials are now the certified apologists for the Arab-Islamic culture of repression, concealment and terrorism. Jews are you dumb, blind and deaf? Or are you suicidal? There is no time left to lose. Flee the damn European continent. A new shoa could happen again. Please, this is a Shoa survivor pleading with you leave now, not tomorrow. There won't be many tomorrows for Jews in Europe. Looking for a failed politician? Federika Mogherini. Looking for a stupid politician? Margot Wallstrom. Looking for a non leader? Pope Francis. It's shameful how all these European leaders with their 'norms & values' are failing their own people and are appeasing their enemies. Europeans have historically been conquered by many many invaders and now I feel they will submit the EU, lock stock and barrel to the Mohammedan snakes that have been plotting the great takeover. The official logo of the EU should be a headstone with R.I.P. engraved on it. Progressive secularists share the Islamic values of AUTHORITARIANISM, cleptocracy and the legitimization of sexual license. PROGRESSIVE secularists also hate Christianity, hate Israel, embrace political globalism and now resemble Jacobins more than classic liberals. If Christians do not fight the tyranny of the Progressive/Muslim axis liberty will be lost. You live in a strange reality. The Pope is always silent when Christians are slaughtered all over the Middle East and sides with the enemies of the Jewish state in spite of it being the only safe state for Christians where they are thriving even volunteering to serve in the military to protect their country, the Jewish state of Israel. I am a Protestant Evangelical. We voted over 60 % for Donald Trump, the greatest anti-Islamist in the USA. We also support Israel more than any demographic group in the world. In contrast, progressives voted for Clinton, and the Islamist Democrat Party at a 90% rate, support Palestinianism overwhelmingly and are globalists. So who lives in a distorted reality. "...instead of condemning this incitement to hatred against the Jewish people..." I believe that this Pope is not a Christian! It is simple. He is a politician using a ancient institution - Catholic Church - to achieve their goals - to bring the Antichrist. Believe or not, this is the truth. Pope Francis Bergoglio is felt by a swathe of Catholics to be a charlatan. Why does the West appease Islam? Isn't this appeasement of the worst enemies of Jews thoroughly mixed with the chronic antisemitism of Europe? Based on their anti Israeli sentiments and acceptance of the violence towards Jews, this statement seems fully justified. I'm surprised that this article mentions Mario Vargas Llosa in a positive light. Vargas Llosa is ashamed to be Israel's friend. "Author Mario Vargas Llosa: I'm Ashamed to Be Israel's Friend"
Haaretz? Haaretz itself is an enemy of Israel from the left. Why don't they fire Pope Francis and replace him with a more suitable leader willing to defend Christendom? The leaders of these nations will never learn. They continue to deny reality. Their citizens are helpless pawns in the middle. Pope Francis will cause a schism in the Catholic Church; his actions are incomprehensible. Either he is blind, or chooses not to believe his eyes. 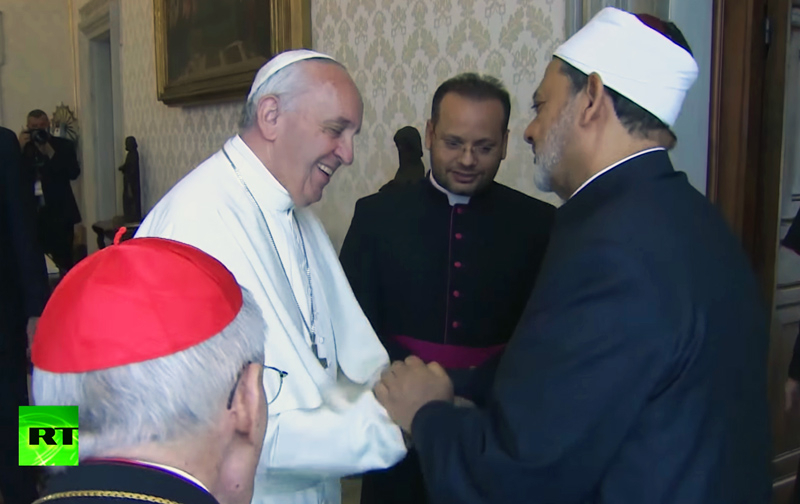 Do forgive me Giulio, but the answer to your question - "How is it possible that Pope Francis does not feel any urgency to denounce the avalanche of anti-Semitism and hate coming from Islamic authorities?" The answer is simplicity itself and it also applies to the Archbishop of Canterbury, they are both SIMPLE MINDED!